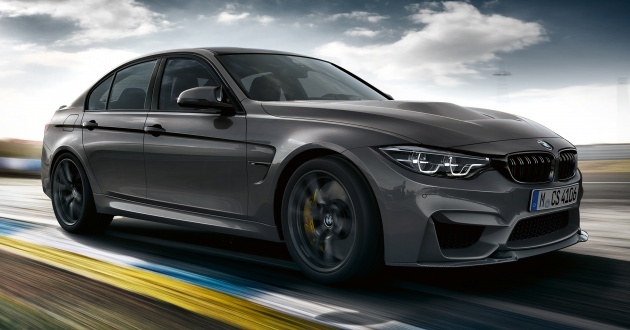 Like the two-door coupe, the M3 CS is powered by a 3.0 litre twin-turbo in-line six-cylinder that serves up 460 hp at 6,250 rpm and 600 Nm of torque at 4,000 to 5,380 rpm. Compared to a regular M3 with the Competition Package, this represents a 10 hp/50 Nm increase. The uprated engine directs drive to the rear wheels via a seven-speed M Double Clutch Transmission (M DCT) with Drivelogic and its own dedicated oil cooler. Performance wise, the zero to 100 km/h sprint is accomplished in just 3.9 seconds, while the top speed is electronically limited to 280 km/h. 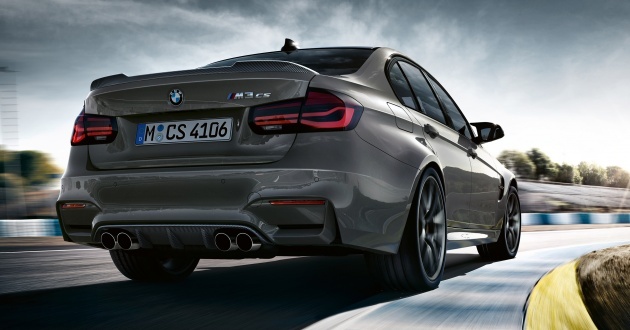 The latter is courtesy of the M Driver’s Package, which comes standard on the M3 CS. To ensure there’s some agility to accompany the brawn, the M3 CS carries over a similar handling setup found on the M3 with Competition Package. Highlights include the Adaptive M suspension, DSC (Dynamic Stability Control) system (with M Dynamic Mode), Active M Differential and fade-resistant M compound brakes (four-piston callipers at the front and two-piston callipers at the rear). The chassis also gets a few exclusive modifications like a lightweight double-joint spring strut axle at the front and a five-link axle at the rear. Additionally, the links and wheel carriers are all made from forged aluminium. A few styling changes helps distinct the M3 CS from the standard car, with carbon-fibre reinforced plastic (CFRP) being used for the bonnet, roof, front splitter, bootlid spoiler and rear diffuser. These items contribute to a 10-kg weight saving over the regular M3. Other features include BMW Individual Shadow Line high gloss trim and darkened rear taillights, where the latter aren’t of the OLED (organic light emitting diode) variety like on the M4 CS. Five exterior body colours are available – Alpine White, San Marino Blue Metallic, Lime Rock Grey Metallic, Frozen Dark Blue II Metallic and Black Sapphire Metallic. Standard wheels are forged light-alloy ten-spokes finished in Orbit Grey Matt, measuring 19 inches at the front and 20 inches at the rear. Those wheels are shod with Michelin Pilot Sport Cup 2 tyres (265/35 profile at the front and 285/30 profile at the rear), but if outright performance isn’t your thing, you can have Michelin Pilot Super Sport rubbers instead. Moving inside, you’ll find leather/Alcantara upholstery that is done up in an exclusive two-tone Silverstone/Black finish. Those at the front will find themselves seated on the same lightweight M sports seats from the M3 with Competition Package, featuring Merino leather with grey contrast stitching. Other items include BMW M-themed front seatbelts, M sports steering wheel wrapped with anthracite-coloured Alcantara and a new red start/stop button. 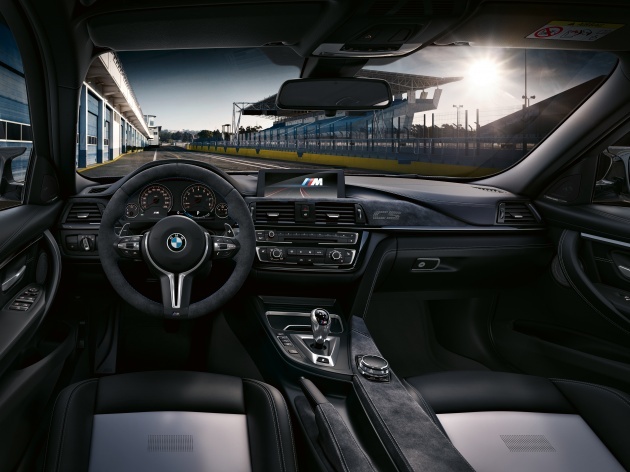 Despite its sporty persona, the M3 CS still comes with creature comforts such as automatic climate control, a Harman Kardon surround sound system and BMW Navigation system Professional infotainment system. Only 1,200 units of the M3 CS will be offered, so hurry if you want one. Title is wrong dude.. isnt it supposed to be M4? M3 is the sedan. M4 is the coupe. only manage till 460hp? better pick GIULIA QUADRIFOGLIO 2.9L V6 505hp then or C63 AMG. U can be driving a 500 plus HP sports car but if U don’t have balls of Titanium, this 460 HP M3-CS will eat U-up. disguise your head. obviously u can see its an m3/m4 from a mile away, because of the bonnet bulge, widened fenders, blue brake calipers, etc. Next Post: Perodua Myvi 2018 – Perincian setiap varian; 1.3/1.5 Dual VVT-i, 4/6 beg udara, VSC, ASA, RM44k-RM55k!